Melbourne, already a popular tourist destination and home to some of Australia's greatest cultural events and festivals, is also quickly becoming Australia's premier destination for major international conventions. -:- Parliament of the World's Religions with 10,000 delegates. -:- International Botanical Congress with 3500 delegates. -:- 2013: International Congress of Pediatrics with 5000 delegates. If you're visiting Melbourne for business, a holiday, or even if you're a local who's discovering Melbourne anew, the following information can help you find out how to make the most of Melbourne! Melbourne Accommodation - Melbourne has a splendid range of accommodation on offer, including Hotels, Motels and even guesthouses.. Perfect for anyone visiting Melbourne for Special Events, Conferences or even a weekend away! Book your airport transfer services before you go from Melbourne and Avalon airports to the city or your hotel will save you time and money. Sunbus provides both International and Domestic visitors with a personal 'meet and greet' service at both airports, along with direct transfer to your accommodation. It's the ideal way to start your holiday or business trip to Melbourne! Sunbus can save you precious time and money, and get to your hotel efficiently and effectively - no waiting for cabs or spending a fortune on transfers. A direct transfer from Melbourne Airport to Melbourne CBD, South Yarra, St. Kilda, Carlton and Outer city suburb hotels (up to 6 kilometers) door to door. You will be collected from Melbourne, South Yarra, St Kilda or Carlton hotel and transferred to Melbourne Airport. When making a booking, you will need to advise your flight details and your Melbourne accommodation details. Your transfer will be confirmed instantaneously and you will be provided with a travel voucher to present to the driver. Melbourne has a wide range of public transport services operating throughout Melbourne, the Suburbs and Regional Victoria. Transport services include Buses, Trains, and of course the Trams that Melbourne is famous for. There are also Train and Coach services that travel from Melbourne's Southern Cross Station to many regional and rural parts of Victoria and also interstate. 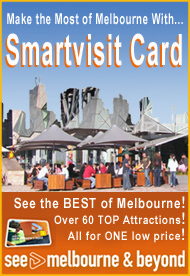 Smartvisit Card | Free Use of Public Transport & Entry to Over 60 Attractions! With your See Melbourne & Beyond Smartvisit Card, you will automatically receive a FREE Zone 1 Metcard that can be used on Melbourne Public Transport. The Metcard allows unlimited public transport rides on trains, trams and buses throughout Zone 1, which includes central Melbourne and the inner suburbs! The Smartvisit Card includes entry to attractions such as Melbourne Zoo, Melbourne Aquarium, Old Melbourne Gaol, Etihad Stadium, Cook's Cottage, Melbourne River Cruises, and many more of Melbourne's TOP sightseeing attractions! Zoos, museums & more across Melbourne & Victoria! -::- Over $800 of entry fees all for ONE low price..
-::- Visit just 2 Attractions a day & you'll save! -::- FREE 128 page guidebook.. Tailored guide to local knowledge on what to see & do! Simply show your card & you're in, no need for cash! Melbourne has so much to see and do, why not set aside a day to enjoy the best Victoria has to offer with one of these fantastic tours! You'll find guided tours and special activities that can cater to any schedule you have with tours ranging from 3 hours to full day tours of wineries, zoos, museums and so much more! Enjoy Melbourne's wonderful blend of modern and heritage architecture, colourful parklands and beautiful waterways - all found throughout this charming city! Melbourne | So Much To See & Do! Smartvisit Card | Free Entry to Over 60 Attractions - All for ONE Low Price! 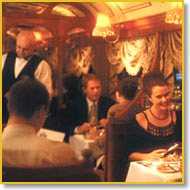 The Colonial Tramcar Restaurant has become a star attraction in Melbourne since it's inception in 1983. Dining on the Colonial Tramcar Restaurant is not only a culinary delight, but also a journey into a little piece of Victoria's past on this converted 1927 tram. While cruising Melbourne's scenic streets, diners can enjoy our fine cuisine and drink the very best of Australian wines or make a selection of beverages from the fully stocked bar at a fully inclusive price. With a splendid range of food styles to enjoy, make the most of your visit to Melbourne by sampling some of the finest meals Australia has to offer! Melbourne is fast becoming the entertainment capital of Australia with an enormous range of festivals, sports events and special attractions taking place all year round! With so much to see and do in Melbourne, you'd be mad to waste one single moment.. There is always something to do or see in Melbourne. With everything from cinema and festivals to food and fashion, live music and more, the choices are endless in Melbourne! 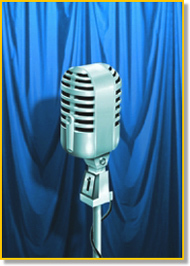 What's On in Melbourne - Weekly Guide out every Monday!